I'm interested in where agency resides when our desires, intentions and behaviours are constantly being tracked and manipulated through the media and technology that we inhabit; how can we claim to have any "authentic" desires? Facebook's "About" section actually states, "You can't be on Facebook without being your authentic self," and yet this is a self that must fit into the predetermined format and is mostly defined by its commercial choices (clothing brands, movies, ice cream, whatever). And those choices are increasingly influenced by the algorithms through the ambient, personalized advertising that surrounds us. So in You Could've Said, which is written entirely in an instrumentalised form of language, i.e. Google's AdWords tool, I'm relaying the impossibility of having an authentic feeling, or even a first-hand experience, despite the seemingly subjective, emotional content and tone. Google search stuff is often seen reflective of a kind of cute "collective self" (hey, we all want to kill our boyfriends sometimes!) but perhaps it's producing as much as reflecting us. It's not just that everything's already been said, and can be commodified but that the devices we share so much intimate time with are actively involved in shaping what we consider to be our "selves," our identities. And yet, despite being entirely mediated, my delivery is "sincere" and heartfelt; I'm really interested in the idea of sincere, but not authentic. I think it's the same reason spambots can have such unexpected pathos; they seem to "express" things in a sincere way, which suggests some kind of "soul" at work there, or some kind of agency, and yet they totally lack interiority, or authenticity. In this and other work of mine (especially Life in AdWords) dissonance is produced by my apparent misrecognition of the algorithmically produced language as my own- mistaking the machine lingo as a true expression of my own subjectivity. Which is not to say that there is some separate, unmediated self that we could access if only we would disconnect our damn gadgets for a second, but the opposite—that autobiography, which my work clearly references, can no longer be seen as a narrative produced by some sort of autonomous subject, inseparable from the technology it interacts with. DR: You mention agency. When it comes to the algorithms that drive the current attention economy I tend to think we have very little. Active participation is all well and good, but the opposite—an opting out, rather than a passivity—feels increasingly impossible. I am thinking about those reCaptcha questions we spend all our time filling in. If I want to access my account and check the recommendations it has this week, I'm required to take part in this omnipresent, undeniably clever, piece of crowd-sourcing. Alan Turing's predictions of a world filled with apparently intelligent machines has come true, except, its the machines now deciding whether we are human or not. ES: Except of course—stating the obvious here—it's just carrying out the orders another human instructed it to, a mediated form of gatekeeping that delegates responsibility to the machine, creating a distance from the entirely human, social, political etc structure that has deemed it necessary (a bit like drones then?). I'm very interested also in the notion of participation as compulsory—what Zizek calls the "You must, because you can" moral imperative of consumerism—especially online, not just at the banal level (missing out on events, job opportunities, interesting articles and so on if you're not on Facebook) but because your actions necessarily feed back into the algorithms tracking and parsing our behaviours. And even opting out becomes a choice that positions you within a particular demographic (more likely to be vegetarian, apparently). Also, this question of opting out seems to recur in conversations around art made online, in a way it doesn't for artists working with traditional media—like, if you're being critical of it, why not go make your own Facebook, why not opt out? My reasoning is that I like to work with widely used technology, out of an idea that the proximity of these media to mainstream, domestic and wider social contexts makes the work more able to reflect on its sociopolitical implications, just as some video artists working in the 80s specifically engaged with TV as the main mediator of public consciousness. Of course some say this is interpassiviity, just feebly participating in the platforms without making any real change, and I can understand that criticism. Now that coded spaces and ubiquitous computing are a reality of the world—and power structures—we inhabit, I do appreciate artists who can work with code and software (in a way that I can't) and use their deeper understanding of digital infrastructure to reflect critically on it. DR: You've been engaged in a commision for Colm Cille's Spiral, sending personal video postcards to anyone who makes a request. Your interpretation of the "confessional" mode seems in this piece to become very human-centric again, since the work is addressed specifically at one particular individual. How has this work been disseminated, and what does your approach have to do with "intimacy"? ES: I've always liked Walter Benjamin's take on the ability of mediating technologies to traverse spatial distances, bringing previously inaccessible events within touching distance. With this project, I wanted to heighten this disembodied intimacy by sending unedited videos shot on my iPhone, a device that's physically on me at all times, directly to the recipients' inbox. So it's not just "sharing" but actually "giving" them a unique video file gift, which only they see, positioning the recipient as a captive audience of one, unlike on social media where you have no idea who is watching or who cares. But also, I asked them to "complete" the video by adding its metadata, which puts them on the spot—they have to respond, instead of having the option to ignore me—and also extracting some labor in return, which is exactly what social media does: extracting our affective and attentive labor, supposedly optionally, in exchange for the gift of the free service. The metadata—tags, title and optionally a caption—became the only viewable part of the exchange, since I used it to annotate a corresponding black, "empty" video on Instagram, also shared on Twitter and Facebook, so the original content remains private. These blank videos record the creative output of the recipient, while acting as proof of the transaction (i.e. that I sent them a video). They also act as performative objects which will continue to operate online due to their tagging, which connects them to other groups of media and renders them visible—i.e. 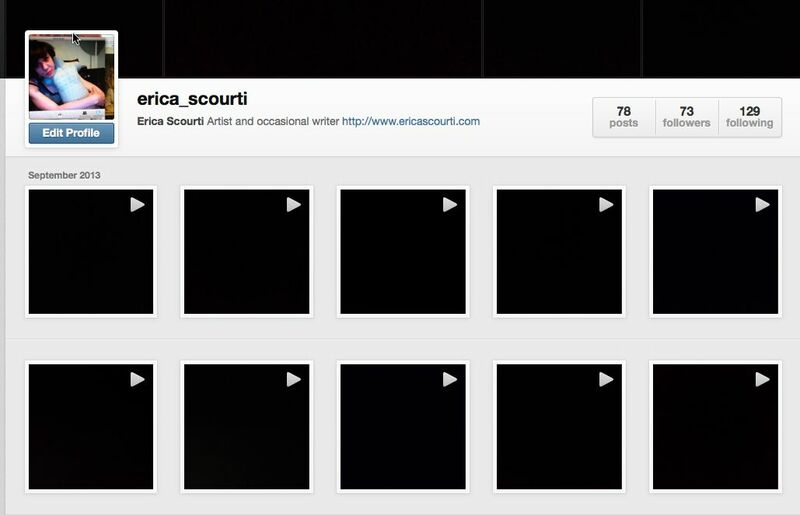 searchable—online, since search bots cannot as yet "see" video content. I wanted to make a work which foregrounds its own connectedness, both to other images via the hashtags but also to the author-recipients through tagging them on social media. So the process of constantly producing and updating oneself within the restrictive and pre-determined formats of social media platforms, i.e. their desired user behaviours, becomes almost the content of the piece. I also like the idea that hashtag searches on all these platforms, for (let's say) Greece, will bring up these blank/ black videos (which by the way, involved a little hack, as Instagram will not allow you to upload pre-recorded content and it's impossible to record a black and silent video...). It's a tiny intervention into the regime of carefully filtered and cropped life-style depictions that Instagram is best known for. It's also a gesture of submitting oneself to the panoptical imperative to share one's experience no matter how private or banal, hence using Instagram for its associations with a certain solipsistic self-display; by willingly enacting the production of mediated self on social media I'm exploring a kind of masochistic humour which has some affinities with what Benjamin Noys identified as an accelerationist attitude of "the worse the better." And yet, by remaining hidden, and not publicly viewable, the public performance of a mediated self is denied. DR: An accelerationist Social Media artwork would have to be loaded with sincerity, firstly, on the part of the human (artist/performer), but also, in an authentic attempt to utilise the network completely on its terms. Is there something, then, about abundance and saturation in your work? An attempt to overload the panopticon? ES: That's a very interesting way of putting it. I sometimes relate that oversaturation to the horror vacui of art that springs from a self-therapeutic need, which my work addresses, though it's less obsessive scribbles, more endless connection, output and flow and semi-ritualistic and repetitive working processes. And in terms of utilizing the network on its own terms, Geert Lovink's notion of the "natural language hack" (rather than the "deep level" hack) is one I've thought about—where your understanding of the social, rather than technical, operation of online platforms gets your work disseminated. For example my project Woman Nature Alone, where I re-enacted stock video which is freely available on my Youtube channel—some of those videos are high on the Google ranking page, so Google is effectively "marketing" my work without me doing anything. Whether it overloads the panopticon, or just contributes more to the babble, is a pertinent question (as Jodi Dean's work around communicative capitalism has shown), since if the work is disseminated on commercial platforms like YouTube or Facebook, it operates within a system of value generation which benefits the corporation, involving, as is by now well known, a Faustian pact of personal data in exchange for "free" service. And going back to agency—the mutability of the platforms means that if the work makes use of particular features (suchas YouTube annotations) its existence is contingent on them being continued; since the content and the context are inextricable in situations like this, it would become impossible to display the original work exactly as it was first made and seen. Even then, as with Olia Lialina and Dragan Espenschied's One Terabyte of Kilobyte Age, it would become an archive, which preserves documents from a specific point in the web's history but cannot replicate the original viewing conditions because all the infrastructure around it has changed completely. So if the platforms—the corporations—control the context and viewing conditions, then artists working within them are arguably at their mercy- and keeping the endless flow alive by adding to it. I'm more interested in working within the flows rather than, as some artists prefer, rejecting the dissemination of their work online. Particularly with moving image work, I'm torn between feeling that artists' insistence on certain very specific, usually high quality, viewing conditions for their work bolsters, as Sven Lütticken has argued, the notion of the rarefied auratic art object whose appreciation requires a kind of hushed awe and reverence, while being aware that the opposite—the image ripped from its original location and circulated in crap-res iPhone pics/ videos—is an example of what David Joselit would call image neoliberalism, which sees images as site-less and like any other commodity, to be traded across borders and contexts with no respect for the artist's intentions. However, I also think that this circulation is becoming an inevitability and no matter how much you insist your video is viewed on zillion lumens projector (or whatever), it will most likely end up being seen by the majority of viewers on YouTube or on a phone screen; I'm interested in how artists (like Hito Steyerl) address, rather than avoid, the fact of this image velocity and spread. DR: Lastly, what have you been working on recently? What's next? 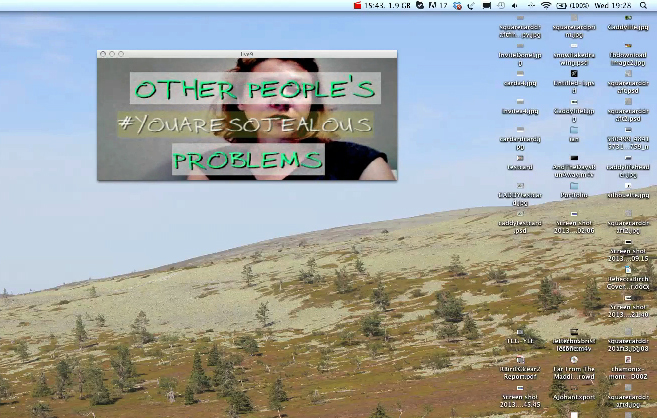 ES: I recently did a series of live, improvised performance series called Other People's Problems direct to people's desktops, with Field Broadcast, where I read out streams of tags and captions off Tumblr, Instagram and Facebook, randomly jumping to other tags as I went. I'm fascinated by tags—they're often highly idiosyncratic and personal, as well as acting as connective tissue between dispersed users; but also I liked the improvisation, where something can go wrong and the awkwardness it creates. (I love awkwardness!) Future projects are going to explore some of the ideas this work generated: how to improvise online (when things can always be deleted/ rejigged afterwards), how to embrace the relinquishing of authorial control which I see as integral to the online (or at least social media) experience, and how to work with hashtags/ metadata both as text in its own right and as a tool. 14, 15 maybe, when I started mucking around with Photoshop—I remember scanning a drawing I'd made of a skunk from a Disney tale and making it into a horrendous composition featuring a rasta flag background... I was young. And I've always been obsessed with documenting things; growing up I was usually the one in our gang who had the camera—showing my age here, imagine there being one person with a camera—which has given me plenty of blackmail leverage and a big box of tastefully weathered photos that, despite my general frustration with analogue nostalgia, I know I will be carrying around with me for life. After doing Physics, Chemistry and Maths at school, I did one year of a Chemistry BA, until I realized I wasn't cut out for lab work (too much like cooking) or what seemed like the black-and-white nature of scientific enquiry. I then did an art and design foundation at a fashion college, followed by one year of Fine Art Textiles BA—a nonsensical course whose only redeeming feature was its grounding in feminist theory—before finally entering the second year of a Fine Art BA. For a while this patchy trajectory through art school made me paranoid, until I realised it probably made me sound more interesting than I am. And in my attempt to alleviate the suspicion that there was some vital piece of information I was missing, I also did loads of philosophy diploma courses, which actually did come in handy when back at Uni last year: I recently finished a Masters of Research in moving image art. At the moment I'm just about surviving as an artist and I've always been freelance apart from time done in bar, kitchen, shop (Londoners, remember Cyberdog?) cleaning and nightclub jobs, some of which the passage of time has rendered as amusingly risqué rather than borderline exploitative. After my B.A., I set up in business with the Prince's Trust, running projects with what are euphemistically known as hard-to-reach young people, making videos, digital art pieces and music videos until government funding was pulled from the sector. I mostly loved this work and it definitely fed into and reflects my working with members of loose groups, like the meditation community around the Insight Time app, or Freecycle, or Facebook friends. I've also been assisting artist and writer Caroline Bergvall on and off for a few years, which has been very helpful in terms of observing how an artist makes a life/ living. I'm just settling into a new space at the moment but invariably, a bit of a mess, a cup of tea, piles of books, and both desktop and workspace are are covered in neon post-it notes. Generally I am a paradigmatic post-Fordist flexi worker though: I can and do work pretty much anywhere—to the occasional frustration of friends and family. Outstanding, thanks for this. One of the best artist interviews in a long time!